Art to Heart regularly offer art courses in some of the most inspiring locations on the Italian peninsula. Our first art course in Italy took place in 2011 in the city of Tivoli near Rome. The art course was a response to numerous requests from people who regularly attend the art programmes run by Jole Bortoli, Art to Heart’s Director. In May 2019 we’ll be travelling to Trani in the Puglia region, South of Italy and in September we will return to the volcanic island of Stromboli. These courses are an exclusive and unique opportunity for art lovers to immerse themselves in one of richest art’s treasure chest, Italy! Be sure that Art to Heart will create a personal, rich and pleasant experience. Jole is native of Italy and although she’s been living and woking in Ireland for the past thirty three years, she regularly returns to Italy to run art courses in selected destinations. These places are ones where she has connections to local people, family and friends, which help make the experience as genuine and enjoyable as possible. The courses will centre on the participants’ free and creative response to the natural and built environment. No previous artistic experience is required. Each day people will work (paint and draw) from 10am to 4pm with the customary lunch break and optional short siesta. There will be guided tours to chosen sites which may include villas, museums or galleries. When these visits take place within the workshop time the entry ticket is included in the price. Other optional visits will be suggested to people who want to explore the area after art-making time. These visits are not included in the price. The fee for each art course is €400 – includes course, art material, one entry ticket to galleries/museums/villas, use of the art studio and booking deposit of €100. The €100 booking fee for Trani is non refundable after 10 April 2019. The €100 booking fee for Stromboli is non refundable after 13 September 2019. Each participant must arrange her/his own accommodation (unless otherwise arranged) and transportation to the venues. Advice will be given on how to get there from the closest airports. 11 to 16 May 2019 – This course is booked out. Trani is a historic fishing port in Puglia, southern Italy on the Adriatic coast. “The town is reminiscent of 1950s films set in old-fashioned seaside Italy: historic buildings fading with casual charm, boats in the harbour and sleepy dogs lazing in the midday sun by the deserted waterfront.” But the town comes very much alive at night when the locals pour out into the streets and on the waterfront to stroll, eat and socialise in the many bars and cafés. Trani has a charming historic centre with lots of laneways decorated with medieval styled banners that reminds of its past as Trani was one port used by the Knights Templars going to and from the Holy Land. 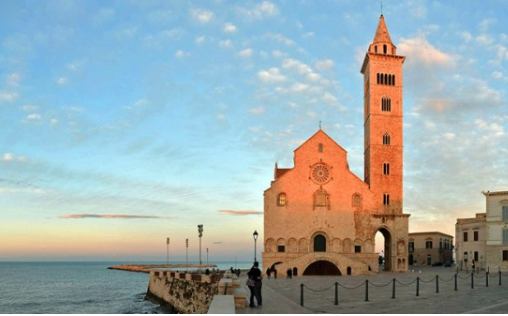 The cathedral, a spectacular building, “a miracle between heaven and earth” is the focal point and primary landmark of Trani, a pink-hued stone structure that sits right on the waterfront where the still active port hosts many pleasure boats and a fishing fleet that provides super fresh seafood for the table! 14 to 19 September 2019. Stromboli, one of the Aeolian islands, north of Sicily, is the Autumn destination of the year, a volcanic island of a sombre, unnerving beauty, with a coastline with steep crags emerging from the sea. The almost total lack of roads, its harsh beauty and, above all, the volcano, which makes its presence felt with outbursts of fire and brimstone, have both a strange and awesome power of attraction. It is a landscape of earth, wind, fire and water. The art course will take place in Ginostra, a small village clinging to the rock, only accessible by sea by means of the smallest port in the world. In this village you have the sensation that time has stopped. There are no cars, just a mule-track along the side of the hill and, as you make you way through the narrow paths flanked by walls made of lava stone, you cannot help but wonder at the luxuriant vegetation made of gigantic prickly pears, caper plants, olive trees, wild rosemary and broom shrubs. Attention: Shops, restaurants and houses in Ginostra are connected by a network of steep and uneven tracks that demand strong legs! To book, get in touch or pay now using Paypal below.